The post you’ve all been waiting for! 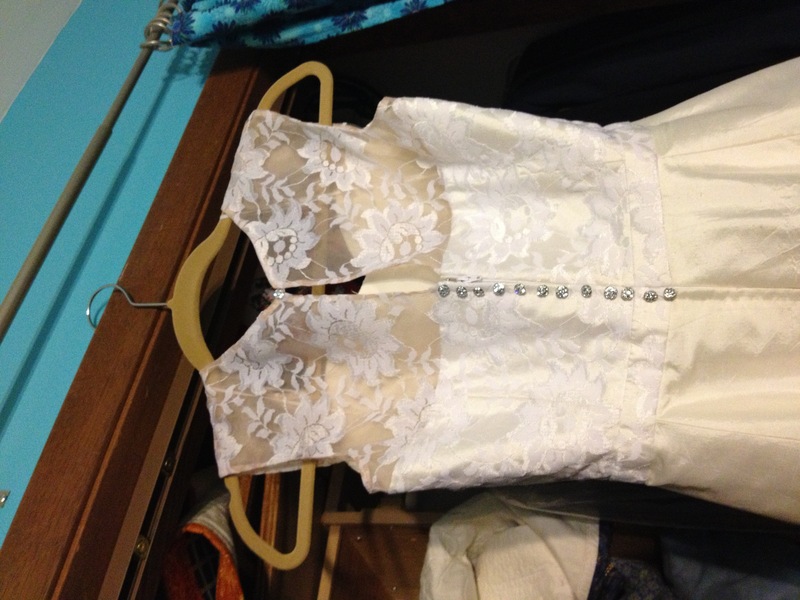 I mean, I’m assuming you do want to see that little dress project that took up nearly a year’s worth of planning and postings on here, right? Full-length dress shot! 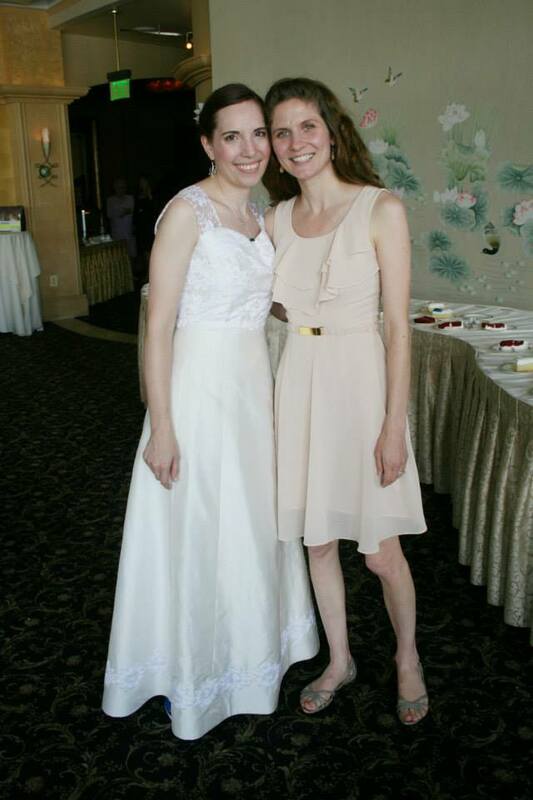 This is me with my friend/honorary bridesmaid Nicole. I wasn’t able to have her as part of the wedding party, but she did the artwork for my invitations and programs, and also did my hair! 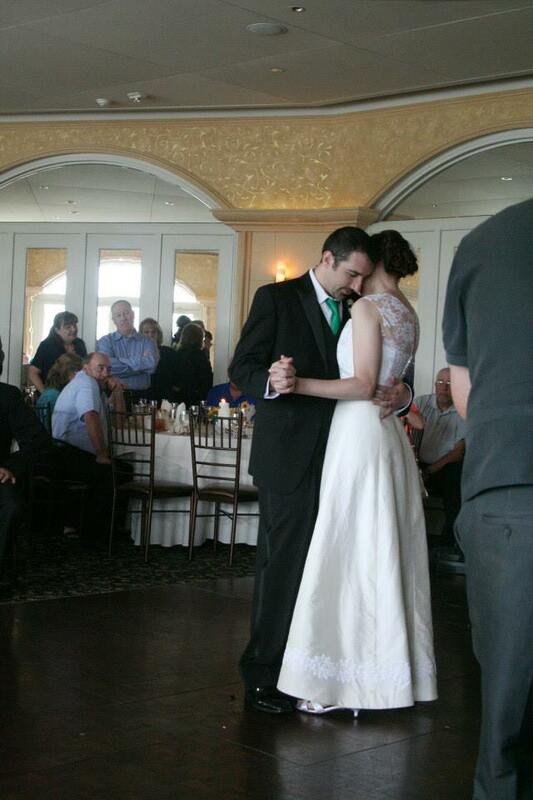 Another full-length shot, this time from the first dance. You can see the border sunflowers a little better on this one, I think. 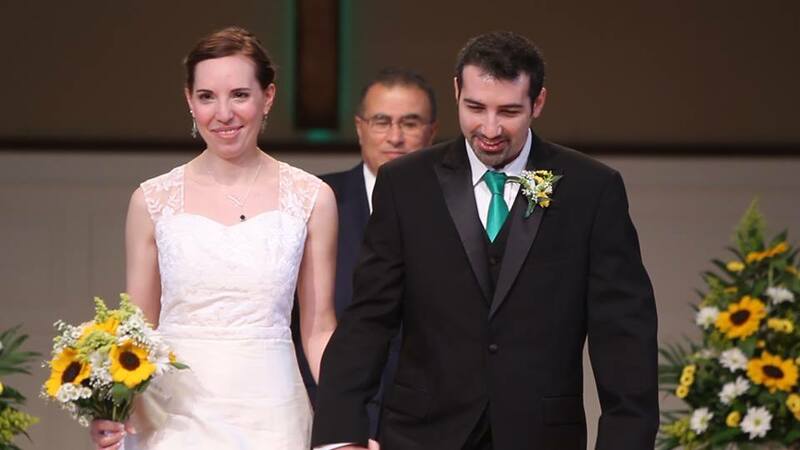 Ceremony shot- not the best expression on my face, but it’s a good closer view of the bodice. And Doug’s tie. And my bouquet! 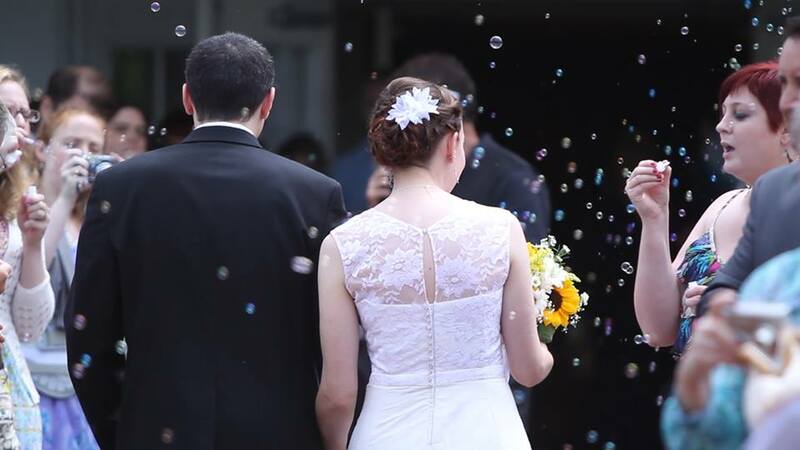 This was as we were all leaving the church–and a great shot of the back! 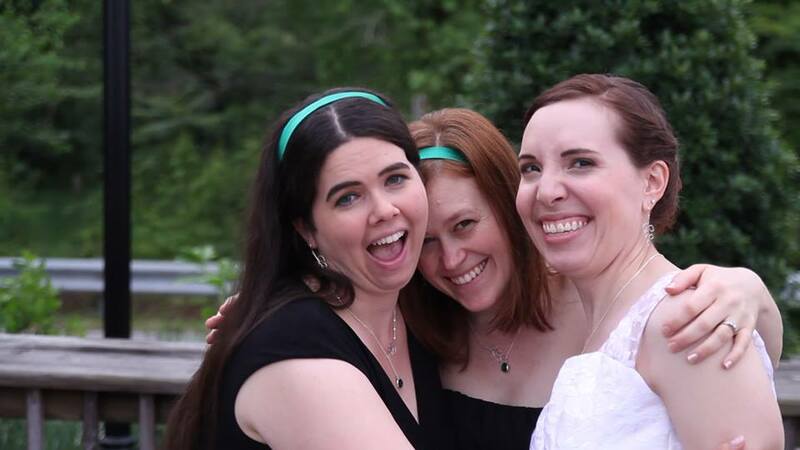 Me and two of my bridesmaids/long-time best friends, Cassie and Julie. The headbands turned out ok after all! 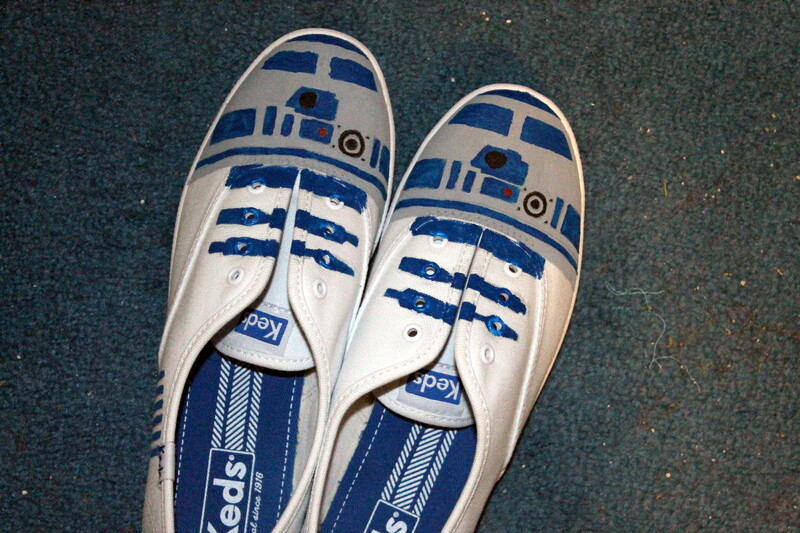 Proof that the TARDIS/R2-D2 shoes made an appearance! We all changed into them after we were done with the outdoor bridal party pictures. So there you have it–I hope the post was worth the wait! Two out of my three bridesmaids, as well as my mom, are also fans. I quite successfully managed to get my fiance interested. And after this scene from a couple of seasons ago, how could I not include something Who in the wedding? I was originally just planning on having a little fun with my tiny TARDIS and phone camera at the reception, since it seemed appropriate. (My maid of honor and I have been having fun over the last few months with taking Instagram photos of a little plastic TARDIS in random places, so you bet that’s going to be going with me on my upcoming trip!) 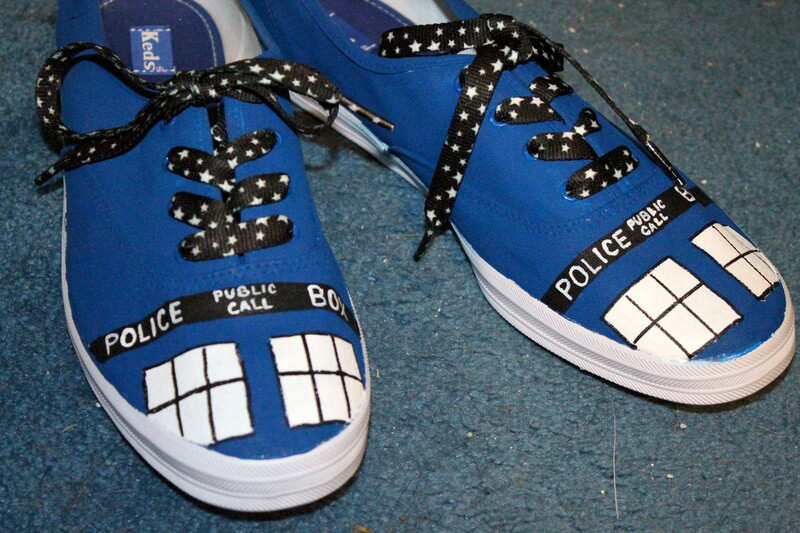 But when my mom noticed that I’d pinned some painted TARDIS shoes onto my “Crafty Geekery” Pinterest board, she suggested that we get some shoes and paint them for the reception! She originally said for myself, my sis-in-law and her, but I pointed out that my maid of honor would want them, too. So with a little help from Sis and a lot of help from Mom, we ended up painting 4 pairs of these! This is basically the gist of them–SIL’s look a little different because when we told her we were doing this, she really wanted shoes without laces, so she has some slip-on canvas ones. 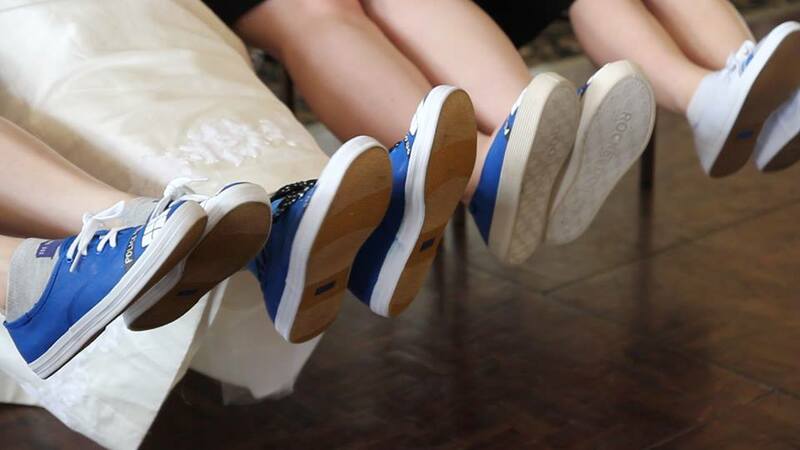 We couldn’t find them in any other sizes (especially not mine), so the other 3 pairs are the standard lace-up Keds. The fun shoelaces were our addition, and my mom, my maid of honor, and I all now have different pairs of laces to go with. 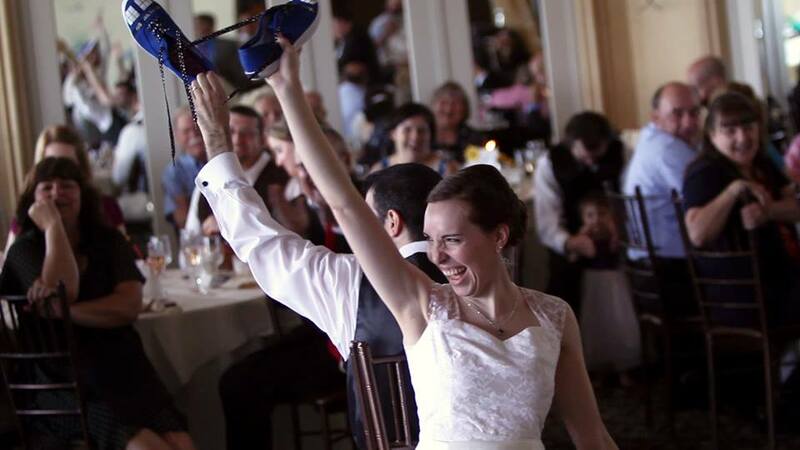 As for my non-Whovian bridesmaid…I didn’t want her to feel left out. Like I said, she doesn’t really watch Doctor Who, but she’s been a huge Star Wars fan for as long as I’ve known her, which is since we were kids. Her favorite character is Yoda, but I wasn’t really sure how to translate that to shoes (I always sucked the most at faces and figures in art class), and we wanted to do something where I could use the same paint we already bought for the TARDIS shoes. So she gets R2-D2! Hmm… I wonder how it would look if I used my seam-ripper to get those Keds tags off of the tongues? #1: That tie I’ve mentioned a couple of times. 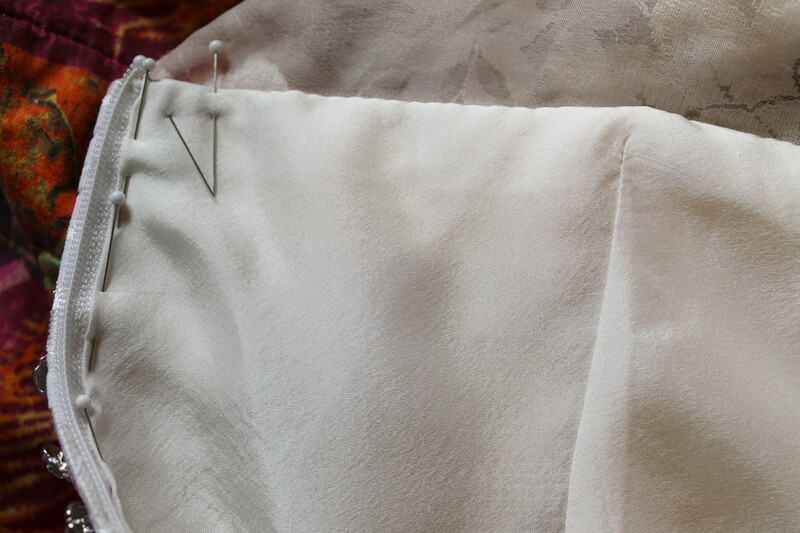 I’m going to be honest and say that I’m not 100% happy with the way it turned out–the poly satin didn’t press well at all, and the interfacing made it just too stiff overall. 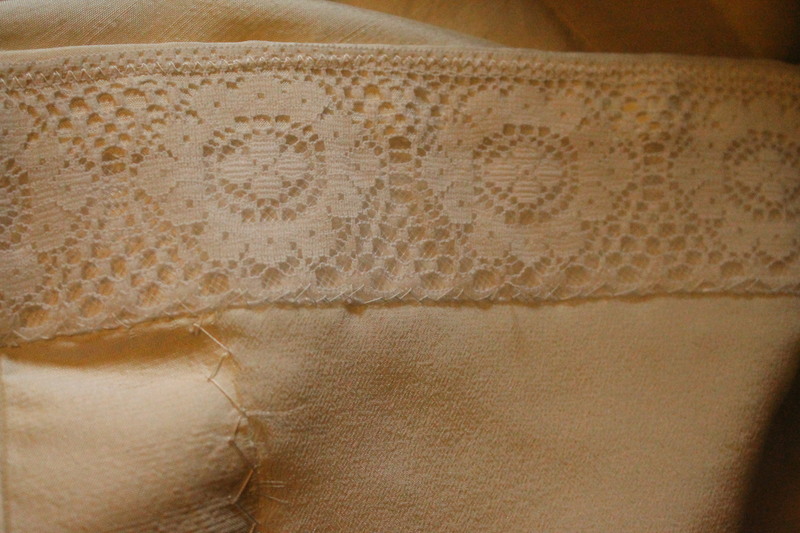 If I was going to go back and do it over again with this fabric, I’d just leave the interfacing out entirely! 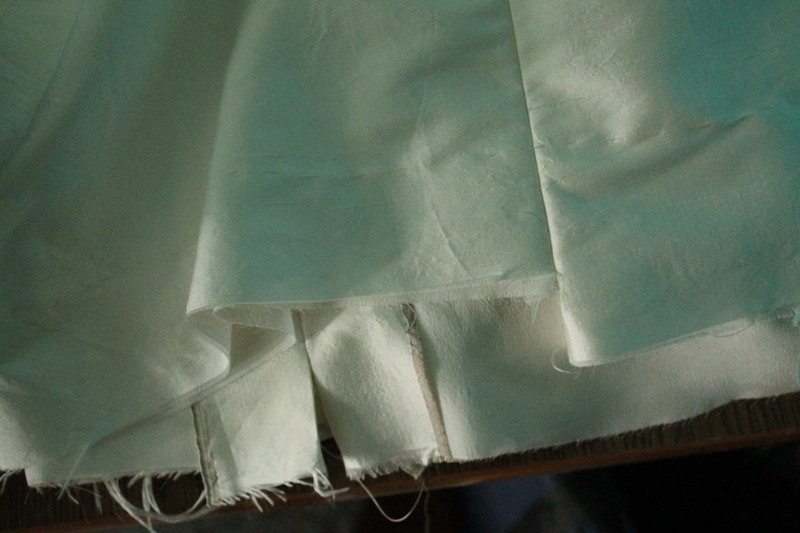 I also had trouble getting the much lighter lining fabric to lie flat in the tie. But after all of that drama involved in finding solid emerald green fabric in the first place, I didn’t have too many options. I’m fully expecting he’ll never wear it again after the wedding day, but I guess I can chalk this up to a learning experience. 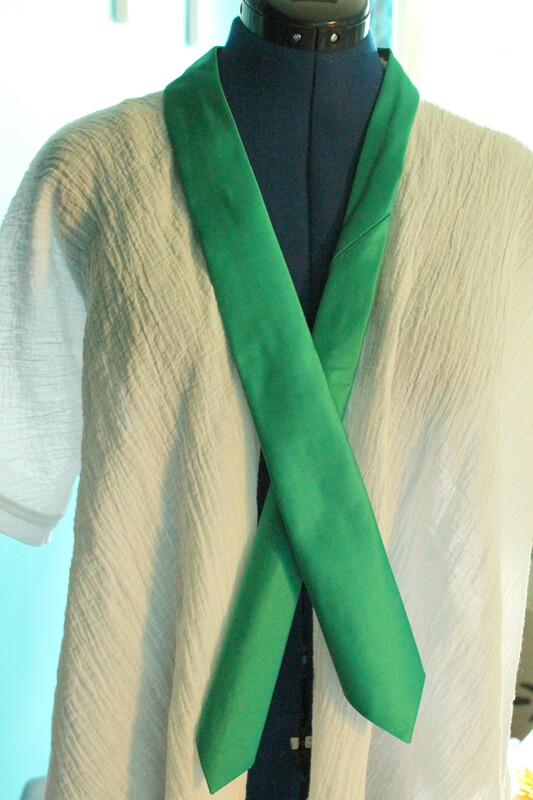 Incidentally, this is also a sneak peek of the shirt I recently finished–I just haven’t had a chance to take a decent outfit photo of it yet, but since I’m planning on taking it on the honeymoon, I’ll see if I can get a shot or two of it there! #2: This one’s been a few months in the making. 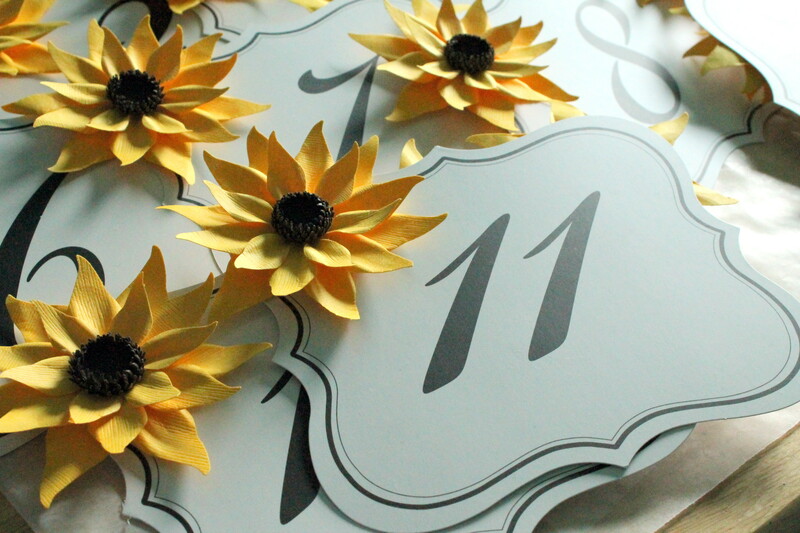 These are the table numbers for the reception, with some cheery paper sunflowers glued to one corner of each side. I can’t take full credit for this, as I had help from my mom, my maid of honor, and even my fiance! The punches were ridiculously hard to push through the paper, so he punched every single petal of these out for me. I definitely found a keeper! I zoomed in and lightened it up so you could see a little more detail on these. I was amazed at how realistic they look! 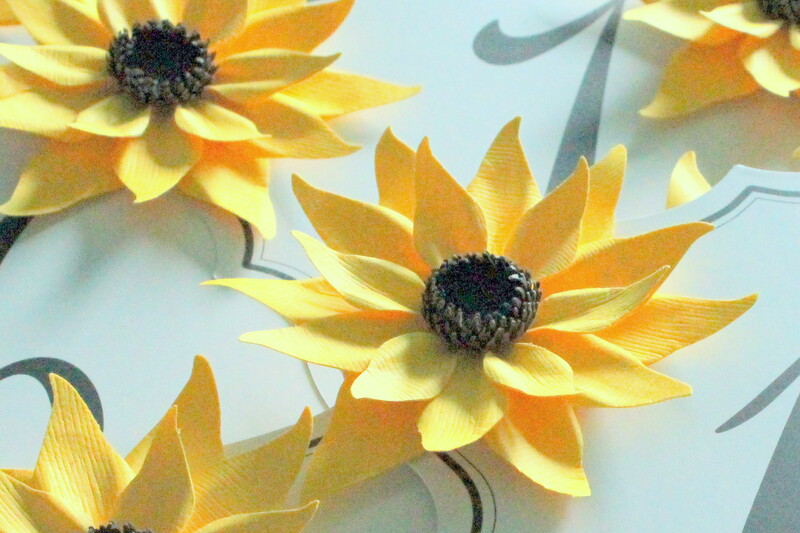 And it was a lot of work, but these are so much lighter than silk flowers, so I think the effect is well worth it. 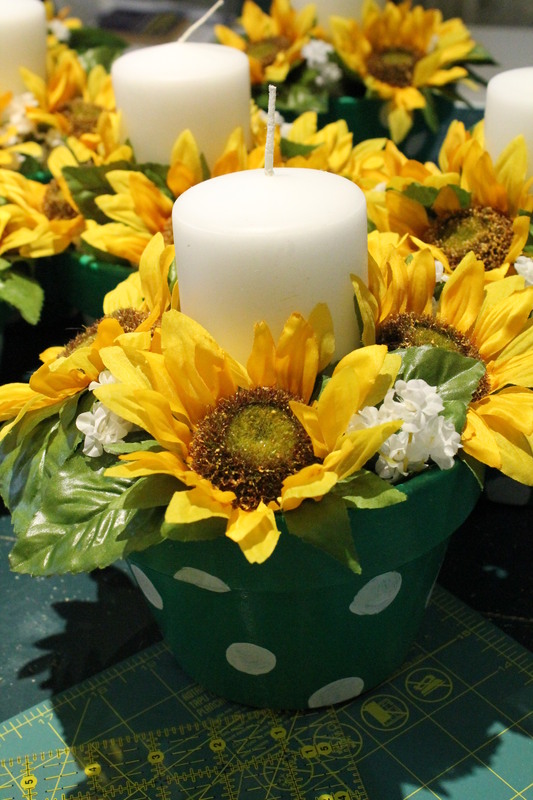 #3: The centerpieces are finally done! 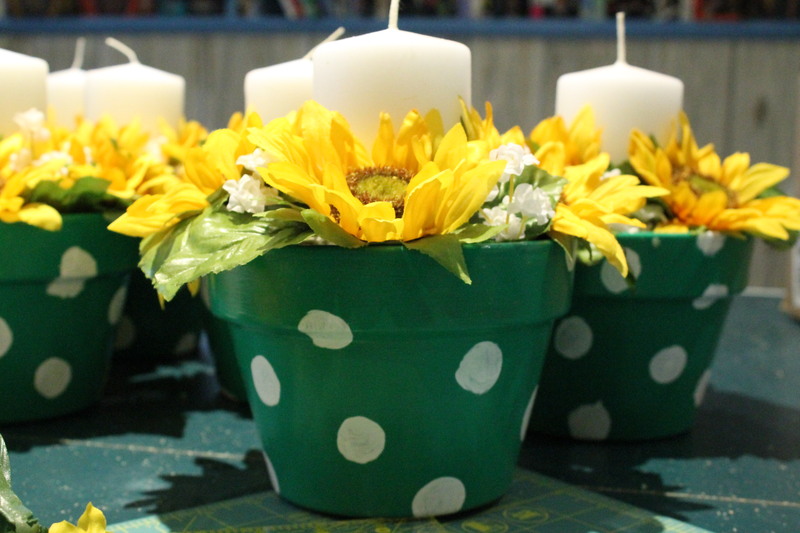 My incredibly awesome maid of honor gets serious props for helping me with both steps of this–we painted all of the flowerpots, and she helped me assemble them this past Saturday while we and my fiance watched the season finale for Doctor Who. We ended up painting several more pots than we needed to, because I didn’t know until after we did it that some of the tables at the reception place could seat up to 12–I’d been under the impression that all of the tables would seat up to 8 people, and was planning for about 18 centerpieces. My math must have been off somewhere, though, because if I’d had to make that many, I wouldn’t have had enough sunflowers! Here’s a better view of the pots–we decided partway through that it reminds us of the 1-up mushrooms from all of the Mario Nintendo games, so I can’t help thinking of that now! I’m going to recycle a good bit of this after the wedding–I plan to make a wreath for the kitchen with the flowers (also doing sunflowers in there), and I have some herbs to plant in the pots. I just need to figure out what to do with a bunch of white candles! This isn’t the last of it, I still have a few more crafts to do, and less than 3 weeks to finish them in! So I guess I’d better get back to work! Doug’s tie, of course. 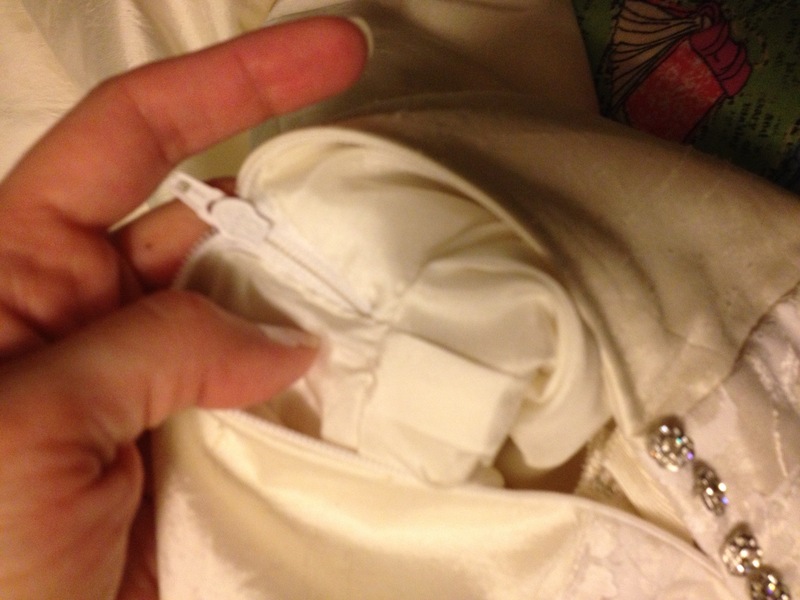 Which will be much easier and quicker to finish, because I can totally sew that while he’s around. Honeymoon clothes! I’ve been plotting my wardrobe for that out in my head, and I’m sure that will get a post at some point. But I do have a few holes that need filling. Particularly, I’d like to make one or two pairs of shorts, and for the sake of time, I’m going to do a total cheater refashion and cut off/hem a couple of pairs of jeans. They’re thrifted jeans that I’ve pretty much only been wearing to the garden shop–one is a little too short for my legs anyway, and the other was a victim of the dryer ink disaster last fall. The obvious damage looks like it’s mostly lower down on the leg than I would need anyway. I do need to cut them long enough that I can also wear them to work in the summer, which means no shorter than mid-thigh, but I think I’d be more comfortable with that length anyway. And both of these pairs fit pretty decently at my waist, so it should do. 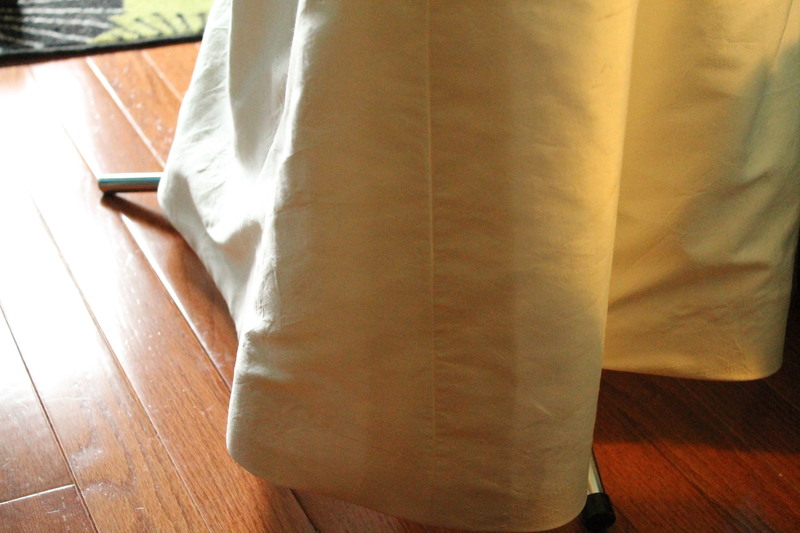 I still totally want to test out my Thurlows on another pair of shorts, but that can wait until after the wedding. Also for the honeymoon, I’d love to do a trial run of the Tiramisu dress! I don’t have too much in the stash that would have the necessary yardage, but I do have some plain navy blue jersey bedsheets that I inherited when my brother got married. 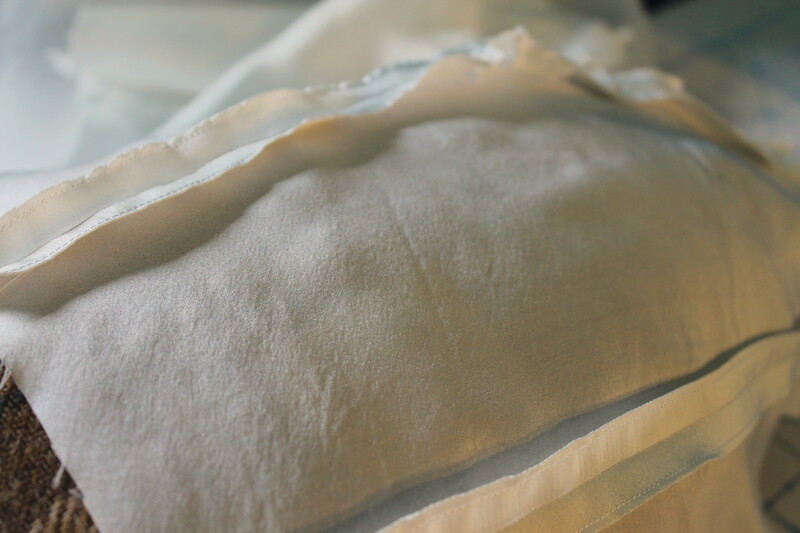 They’re too big for my bed, so I’ve been hoarding them for the last few years purely for muslin purposes, and navy blue should fit wonderfully into the color scheme that’s shaping up in my head. I’d also like to knock out a quick tank top as a palate-cleanser, and I have a potential idea for a layering piece. Because you know I will be the one who will get cold on a tropical island! @sew_and_so OK, #sewingdare: Treat yourself to a cute new pattern and lovely fabric to make it! You deserve a treat! I’ve been wanting a more autumn-friendly dress for awhile now–most of my dresses have no sleeves and are in summery colors. I have two weddings to attend this fall, and will need something to wear. I’m a bridesmaid in one of them, so that’s covered, but I still will probably need something cute to wear for rehearsal dinners and such, right? Even though it’s a longer-sleeved dress, it doesn’t look frumpy. Those are hard to find. 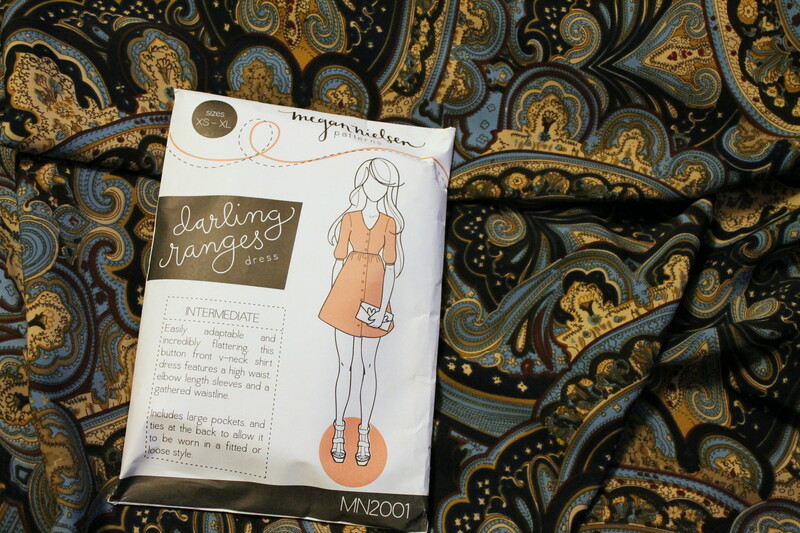 As it turns out, it’s a good thing the Darling Ranges won out, because apparently I just won the Reglisse pattern from a giveaway at Paunnet! Thanks, Anna! I tried to be smart about the fabric choice, and choose a print that–guess what–already went with a bunch of things in my wardrobe! So I was thinking that I could layer this with my brown jacket, or my brown hoodie cardigan sweater, or the thrifted tan jacket that I picked up recently, or throw a coordinating knit top over it and wear it as a skirt, and so on. (My other choice was this adorable dragonfly print, but I realized that would require a lot more effort to work as a layering piece. I also managed to resist the temptation to further break the pledge and buy both pieces.) Also, as far as fabric choice goes, I do have a serious weakness for paisley! Maybe this would work better as the Reglisse. What do you think? here!!! 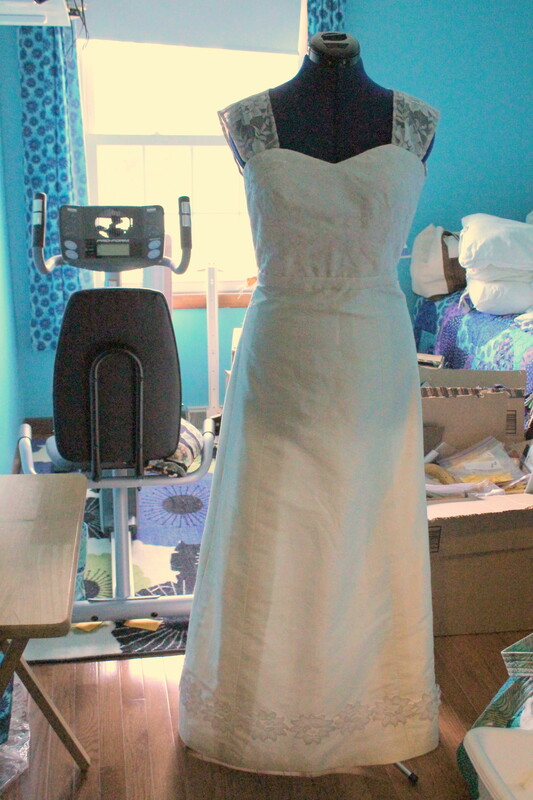 It took me hand-stitching straight up to midnight, because I was so easily distracted while sewing, but the dress is officially DONE! I’m going to wait to do the big final reveal pictures until after the wedding, because then I’ll have the best pictures with my hair all done up nice and out of the way. But I do have two last detail shots from the lining, courtesy of my phone, since I’ve been working on this in the evenings over the last 2 days while it’s been too dark to use the nice camera. 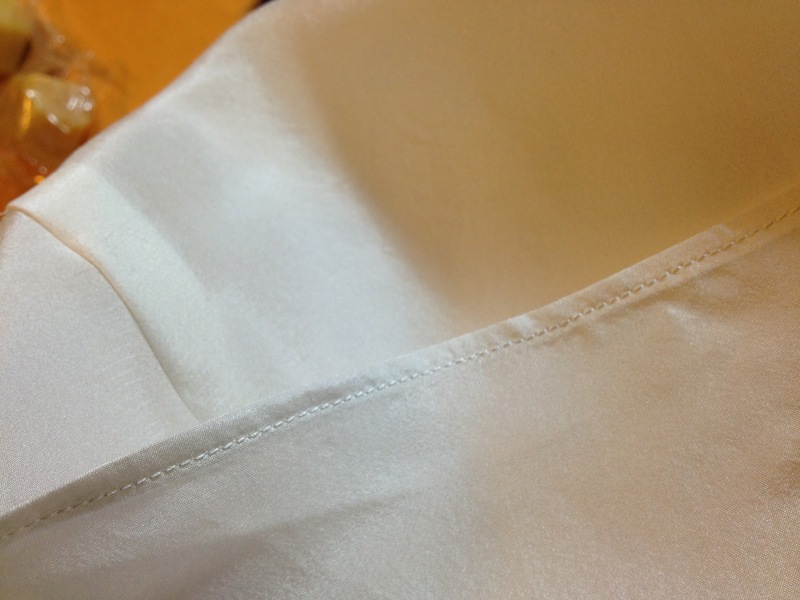 I did a narrow machine hem all around the lining–partially to speed up the process, and partially to practice the technique. I have another friend getting married this year, she already has her dress, and it fits perfectly other than it being too long, so I told her I’d hem it for her. She’s practically my honorary bridesmaid, so I don’t mind. 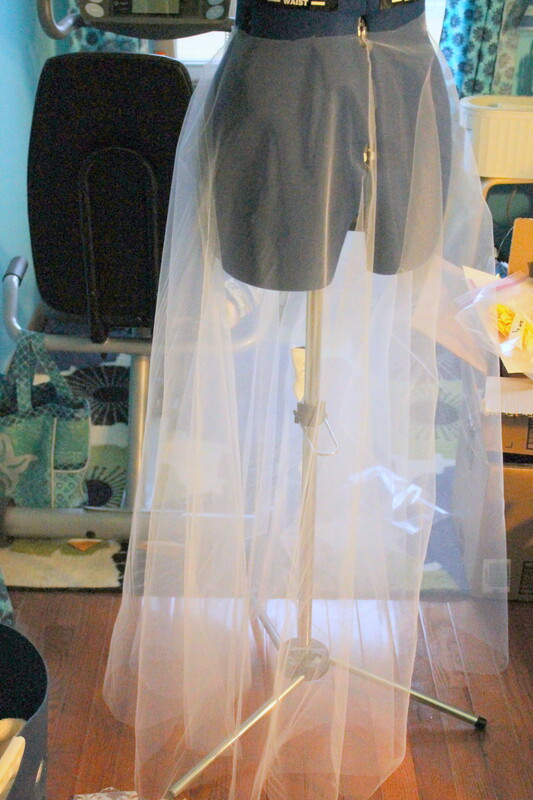 I also have a bustle, sort of–I discovered after pinning in and partially sewing the lining that the center back was hanging past the hem of the dress! 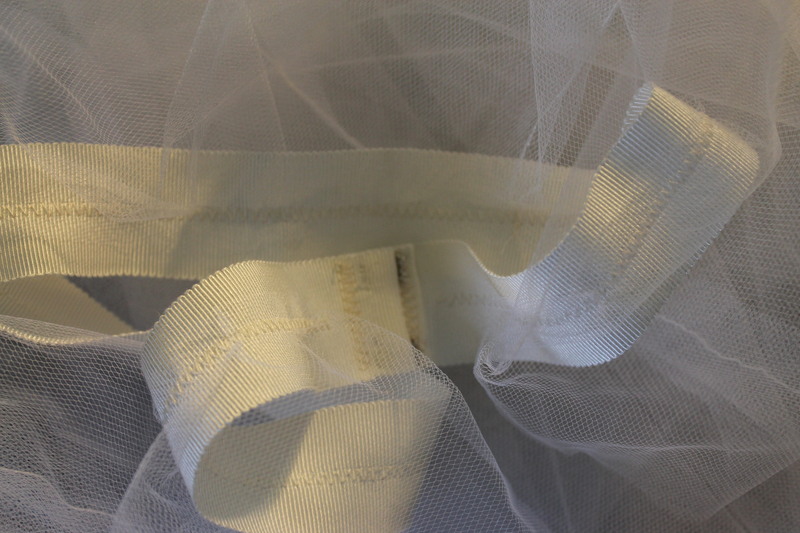 At this point, I’ve stopped caring about perfection and just wanted to finish, so rather than rip out and redo that portion of the hem, I figured no one will see it but me, so I just tacked that up and secured it under the zipper. So, aside from the final reveal, that’s it! Thanks to all of you who have followed along on this massive project and left encouraging words. And you bet my next couple of projects are going to be much less complicated!